I love easy recipes. And I’m talkin’ “don’t even need to get out a knife” easy. That is this recipe. Or these by Alexia Foods. Find ’em in the freezer section of the grocery store. There are other brands, but many contain artificial flavor and/or additives and preservatives, so check your labels. If you’re looking for something more exciting than this basic recipe, you can make variations with onions, spinach, ham or sausage. Instructions for each are provided below. (Some require a knife and cutting board, or pan and spatula, but they’re still easy, I promise!) You could also throw in a little garlic or onion powder, dry mustard powder, or chopped fresh or dried herbs. Or use your own creativity! Pickled jalapeños, diced bell peppers, sautéed mushrooms, chopped bacon? All sound good to me! Egg casseroles are wonderful served straight from the oven (all that melted bubbling cheese on top!). 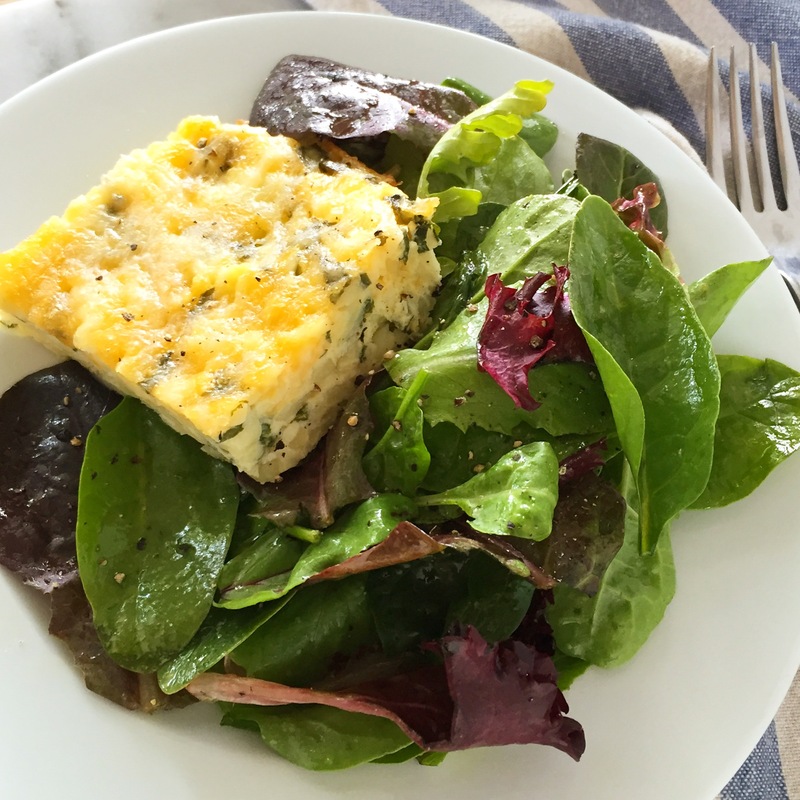 They can also be made ahead and re-heated in individual portions for a protein-packed breakfast, lunch or dinner. This image also includes diced ham and chopped spinach, which can be added as a variation. Use butter or non-stick spray to grease a 11 x 9″ rectangular pan. Preheat oven to 350 degrees F.
Mix the 6 extra large eggs, 3/4 cup milk, 1/2 cup grated cheese, and 1 16-oz. package of frozen shredded potatoes in a large bowl. (Check the ingredients on the bag of potatoes — some have salt and pepper and other seasoning already added, so you won’t need to add as much S&P yourself.) Season with a big pinch of salt and a few grinds of black pepper. Pour mixture into the greased pan. Sprinkle the casserole with remaining 1/2 cup grated cheese. Cover with foil. Bake at 350 degrees for 1 hour. Remove foil and bake for 30 minutes more. Let cool 10 minutes before serving. For easy serving, slice pieces with a sharp knife and scoop out with a cake spatula. ONION: 1/2 diced medium yellow onion + 1 Tablespoon olive oil. Heat olive oil in a medium-sized pan over medium-high heat. Add the onion; sauté until tender and translucent, stirring occasionally. Remove from heat and set aside to cool. When the onions have cooled, add them to the bowl of egg mixture and stir to combine. Pour mixture into greased pan and follow cooking instructions above. SPINACH: 8 ounces chopped frozen spinach, defrosted. Frozen spinach retains a lot of water, so after defrosting it, you’ll need to drain it. To drain the spinach, wrap it in two large paper towels. Holding the bundle of spinach over the sink, squeeze the spinach inside the paper towels (similar to squeezing out a sponge) and allow the water to drain out. Add the drained spinach to the bowl of egg mixture and stir to combine. Pour mixture into greased pan and follow cooking instructions above. HAM: 7-8 ounces diced ham, uncured if possible. Add the diced ham to the bowl of egg mixture and stir to combine. Pour mixture into greased pan and follow cooking instructions above. SAUSAGE: 1 lb. of all-natural (MSG-free) bulk pork breakfast sausage such as this one + 1-2 tablespoons real maple syrup. Place the sausage in a pan over medium-high heat. As the sausage cooks, break it up into small pieces with a wooden spoon or spatula, and cook until sausage pieces are browned and cooked through. Drain the grease and discard. Pour maple syrup over the cooked sausage and toss to combine. Set aside to cool. When the sausage has cooled, add it to the bowl of egg mixture and stir to combine. Pour mixture into greased pan and follow cooking instructions above. You can bake the casserole up to 48 hours in advance. Just bake for the initial 1 hour, covered with foil; then, cool completely and refrigerate. About 45 minutes before serving, remove foil and bake the additional 30 minutes to warm through. Alternatively, you can bake the casserole for the full 1 hour and 30 minutes, let it cool and then refrigerate the casserole for 4-5 days, cutting out and reheating individual servings as needed. SALAD: Toss mixed greens with a bit of olive oil, white balsamic vinegar and S&P. Add tomatoes, sliced cucumbers, shredded carrots for more color if you wish. Let marinate for a few minutes and then serve alongside a slice of egg casserole. 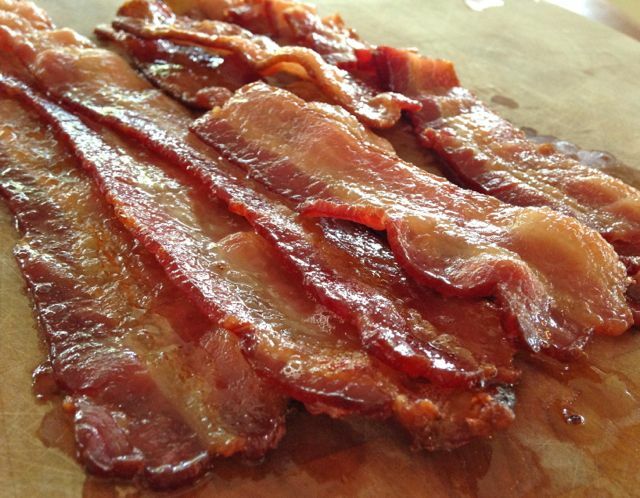 BACON: Follow these instructions for cooking bacon, and serve alongside the casserole. 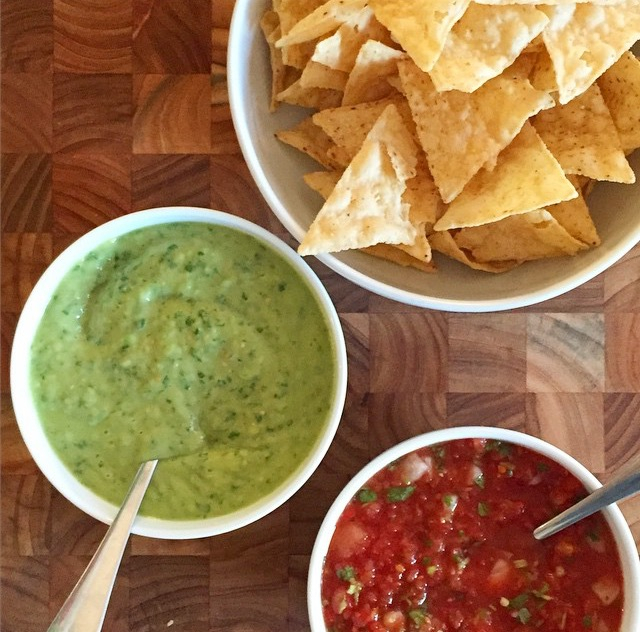 SALSA: Whip up this 5-minute salsa verde and pass the bowl at the table. Looks great! Could I shred my own potatoes? Thanks!